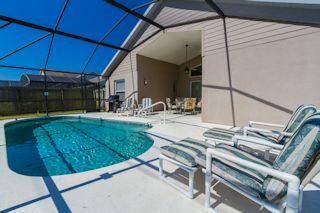 This superior new Executive 4 bedroom villa is only a few short miles from Magic Kingdom. Many homes promise luxury executive accommodation, but just compare with our home before you choose. 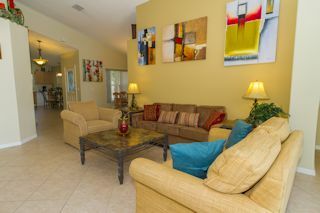 Our 4 bedroom 3 bathroom home has been especially designed as a vacation villa for the Kissimmee area. 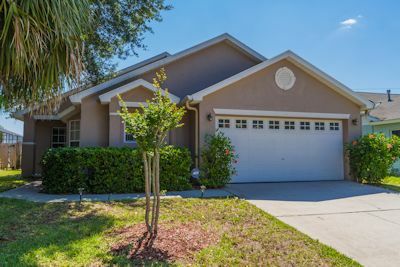 We have spared no expense in appointing this luxury home to meet every need that you may have whilst visiting the theme parks and attractions of central Florida. Our private, heated screened pool guarantees fun in the sunshine and the perfect spot to soak in the rays or splash into the cooling waters of our pool. Sit on one of our balconies and watch the setting sun paint soothing pinks and purples in the sky as you sip your drink. Sleeping arrangements include 2 master bedrooms - one with a king-size bed, large walk in wardrobes and an en-suite bathroom with 'Roman' tub, twin shower and double vanity basin. The other master has a full bed with its own en-suite. Bedrooms 3 and 4 are twin bedrooms with a bathroom shared between. 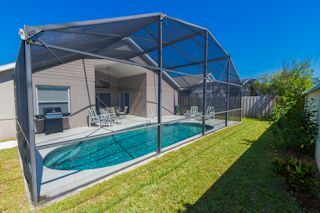 We really mean it - everything that our guests have asked for has been added to for further enjoyment, you'll want for nothing in this luxury villa in the Indian Creek sub-division of Kissimmee. 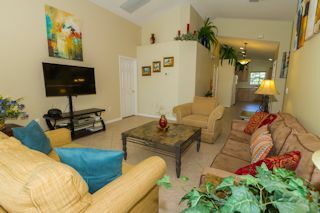 Our living area opens out to the pool deck and has every amenity for your family to enjoy.. Sit and discuss the excitement of your day, or watch your favorite movie on our entertainment center, or listen to your favorite CD's (you should bring them with you!) on our stereo system. Our super kitchen has every amenity to make cooking a pleasure. 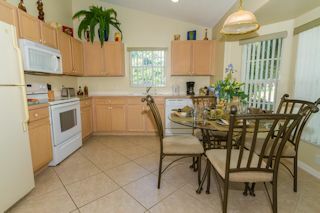 It's also got a breakfast area so that you can enjoy the mornings together. Our dining area has been especially designed to cater for a large family group to enjoy a superb meal in the house. 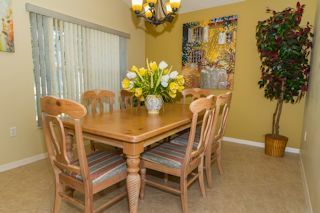 Sit around the formal dining table or the nearby breakfast table to eat and talk about your fabulous days of fun while on vacation. 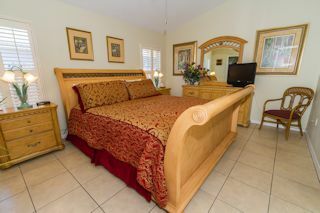 Relax at the end of your hectic day in one of our 2 comfortable master bedrooms. All the comforts of home in serene and peaceful surroundings....just lie back and dream of the Disney magic as you drift away. This bedroom has a king-size bed, cable TV and walk in closet, with an en-suite bathroom incorporating a double vanity unit, twin shower and a corner 'Roman' bath tub. 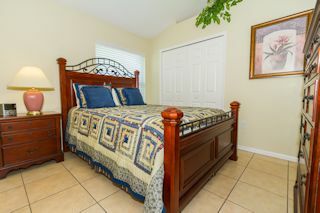 Our second master bedroom is just a comfortable as our first, but has a full-size bed, walk-in closet and en-suite bathroom. 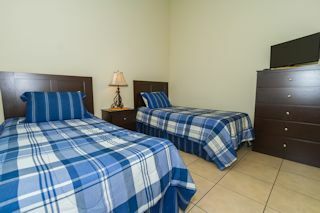 Each of our 2 comfy twin bedrooms has walk-in wardrobes, a night stand, and two twin beds. 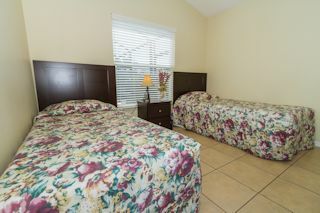 They're ideal rooms for your kids to drop-off to sleep in, after a busy and exciting day at the parks and amusements of Kissimmee. The ultimate in luxury relaxation. Our pool and sun-deck offer the perfect place to play. 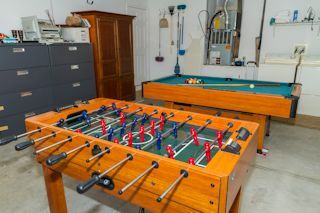 With a large pool and deck area, your whole family can stay and play. Kid's just love to frolic in our private, fully screened pool. Parents can relax and let their cares float away as the sun sparkles on the water. There's plenty of room for an eat-out, and the evenings are a simply stunning way to unwind while watching colors of the Florida dusk from the shaded lanai.